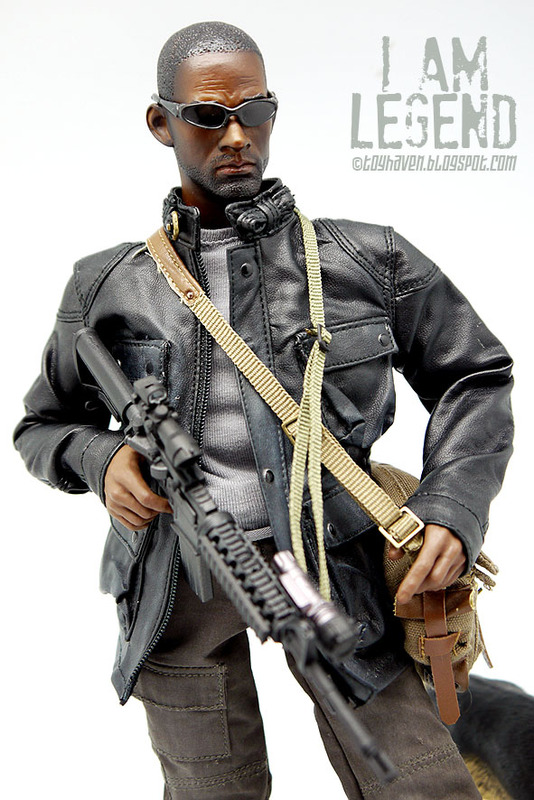 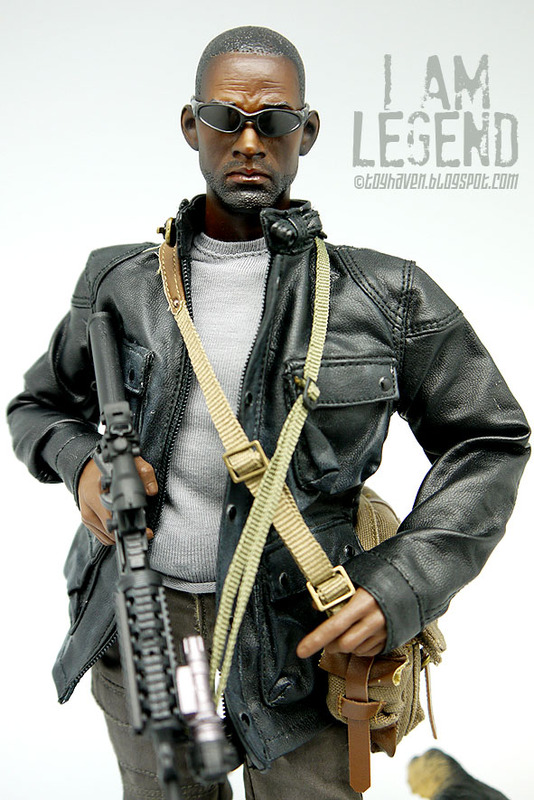 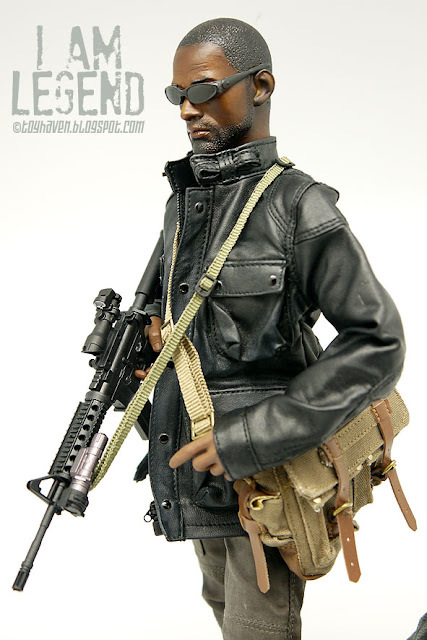 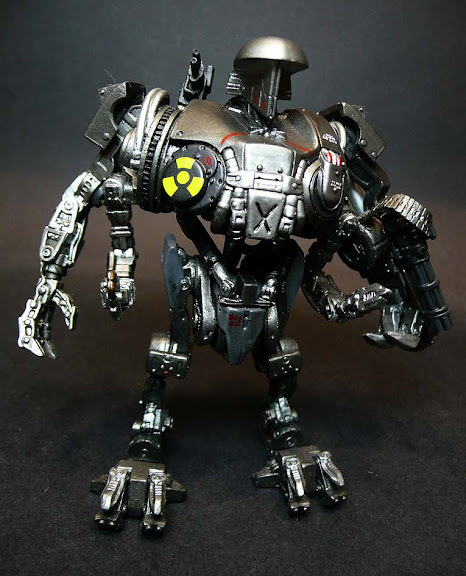 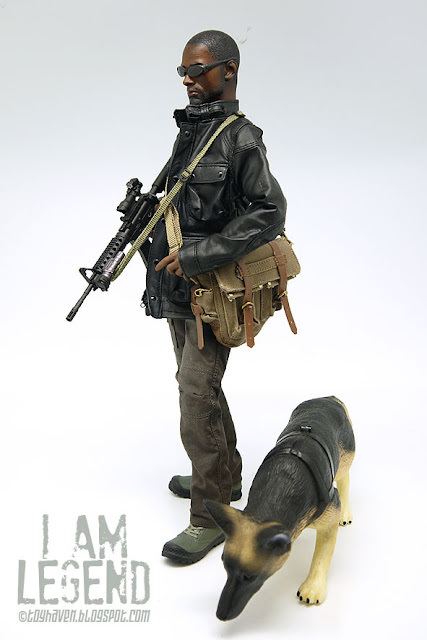 This is the latest Will Smith "I am Legend" Robert Neville I have put together and this one is the easiest because almost everything you see was released by MC Toys. 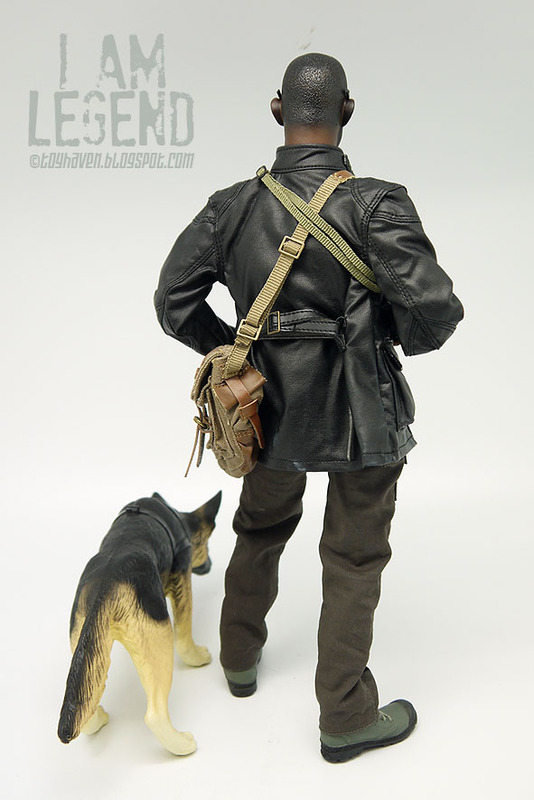 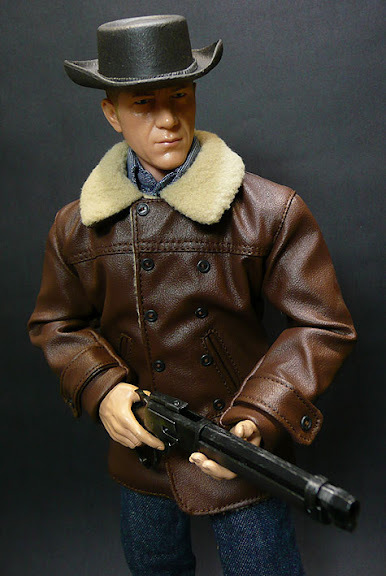 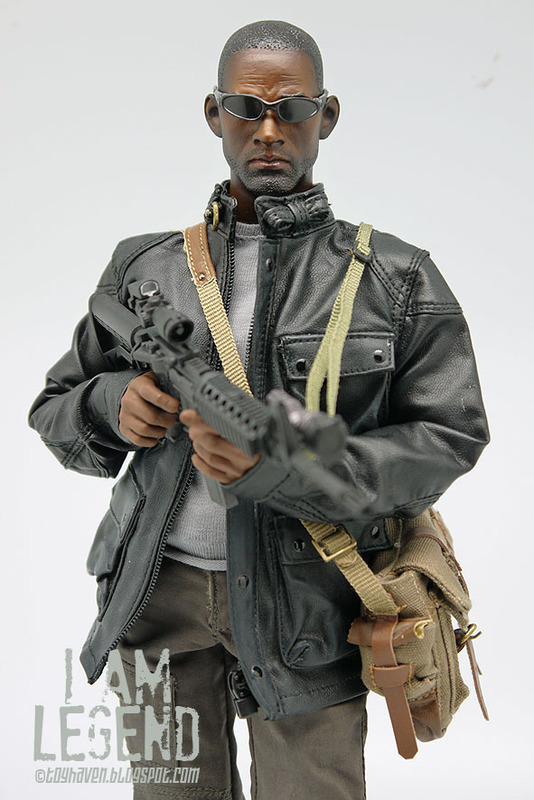 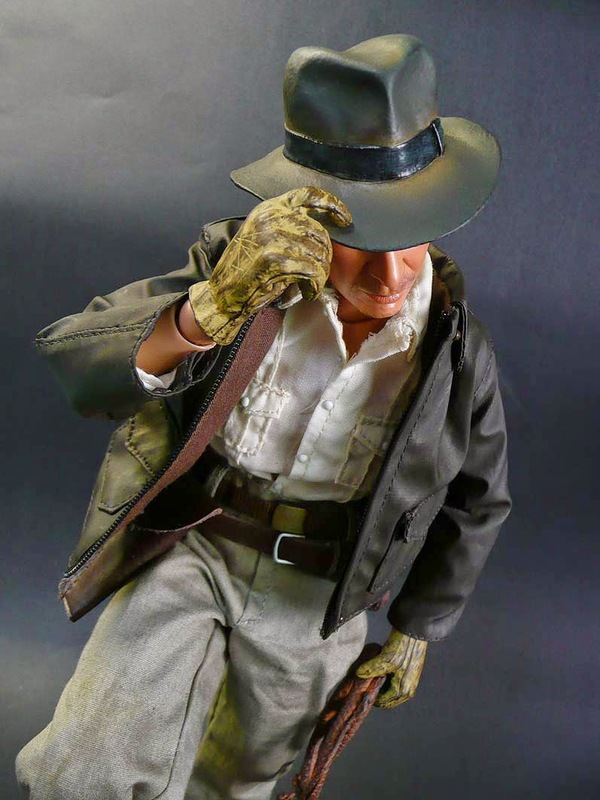 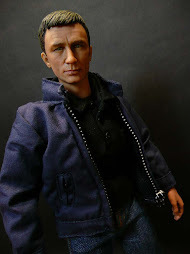 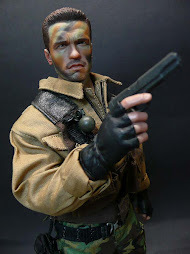 This MC Toys 1/6 scale Trialmaster Leather Jacket suit was produced specifically so that you can kitbash your very own 12-inch Will Smith "I am Legend" Robert Neville action figure. 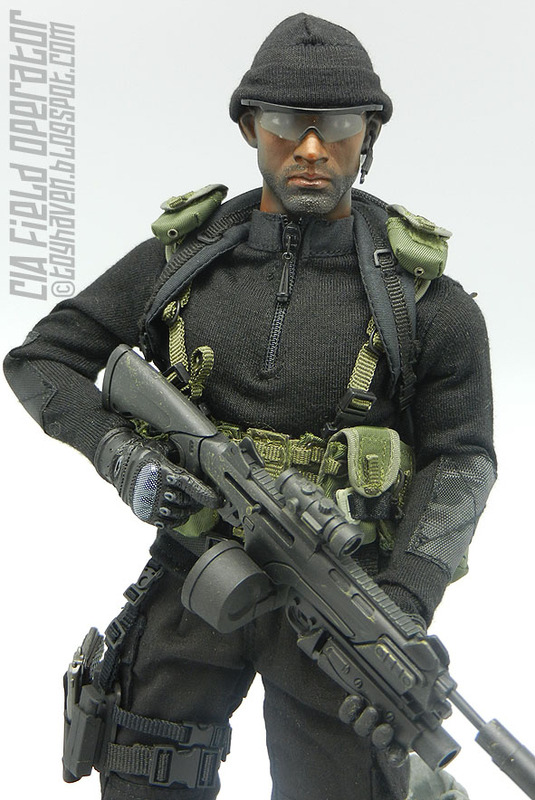 All you need is the 12-inch figure body and 1/6 scale Will Smith head sculpt. 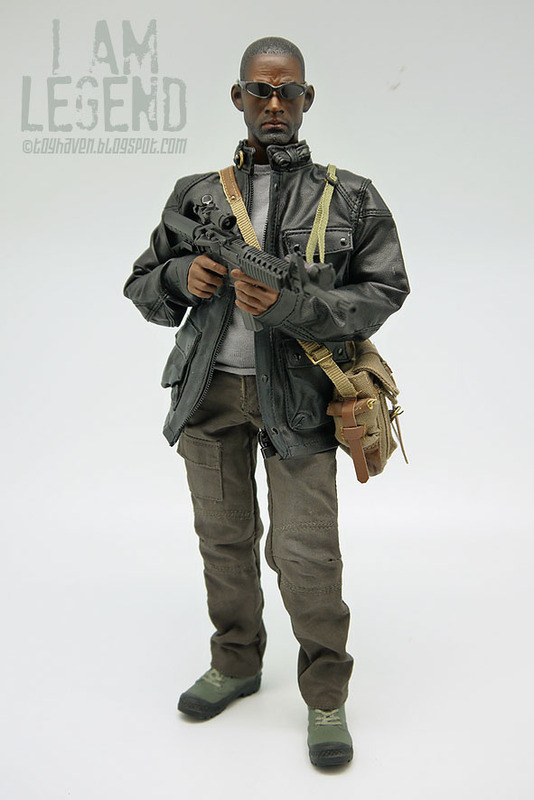 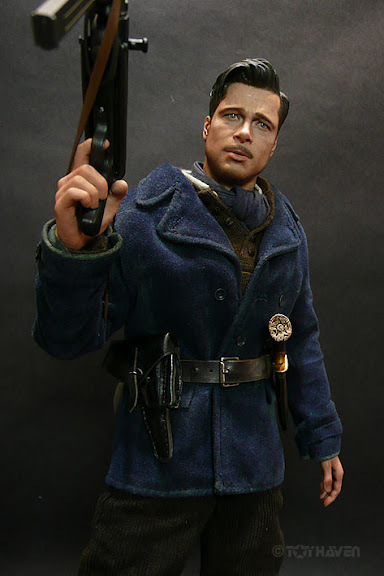 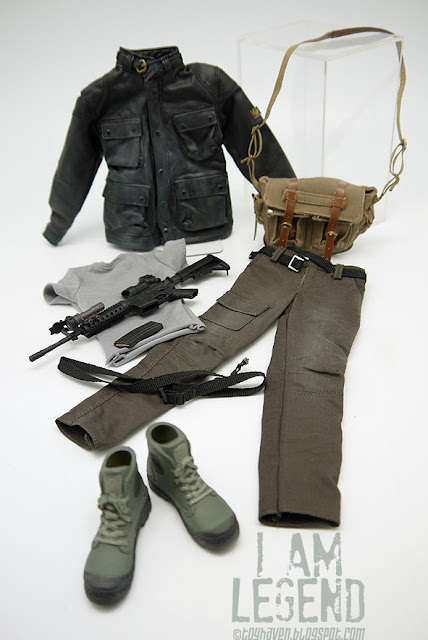 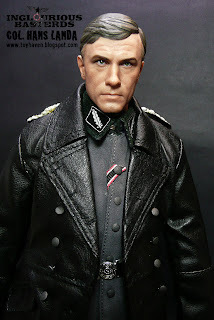 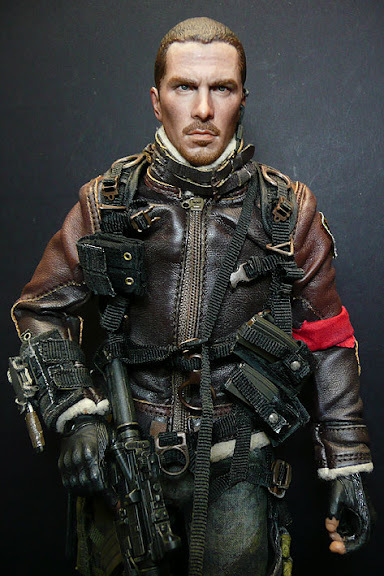 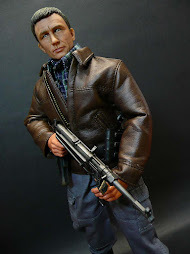 MC Toys 1/6th scale Trialmaster Leather Jacket suit (Product MCF-016) comes with 1/6th scale Belstaff Trialmaster Legend Jacket, Belstaff Longway Triple Canvas Trousers, Belstaff Shoulder Bag 554, Palladium Pampa Shoes, Short Sleeve T-shirt and M4 Rifle. 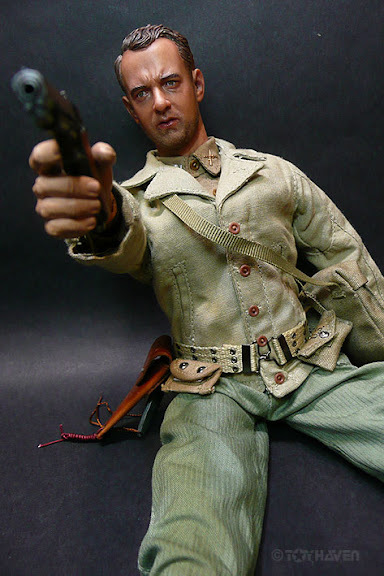 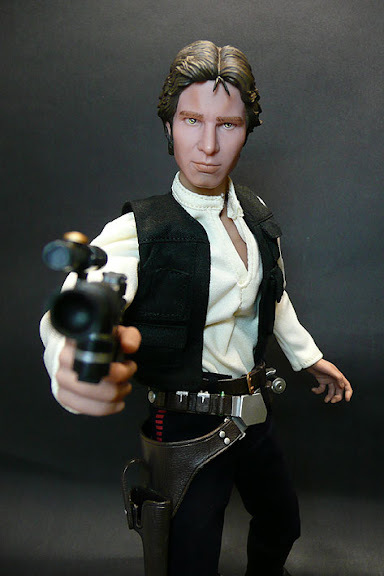 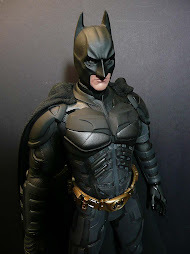 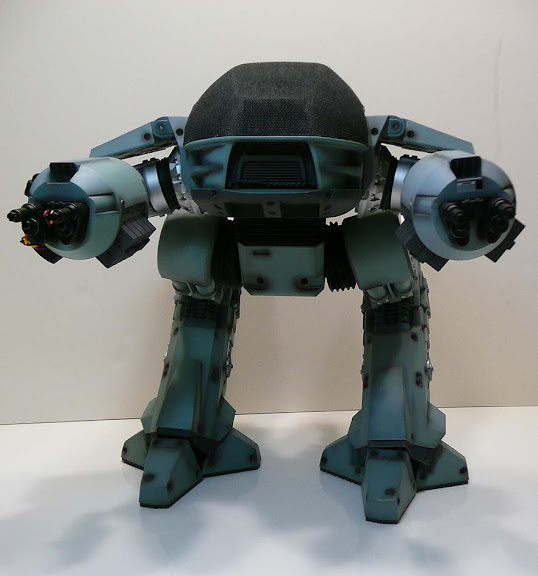 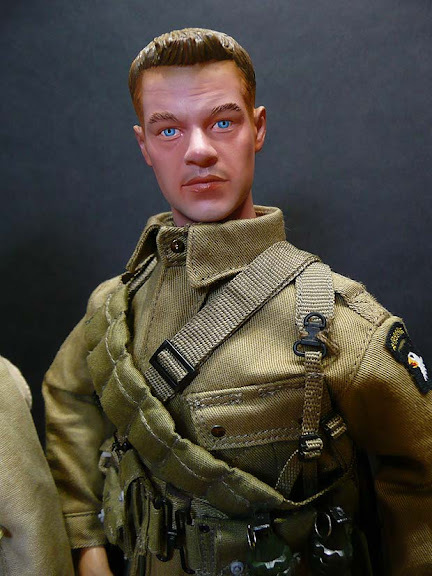 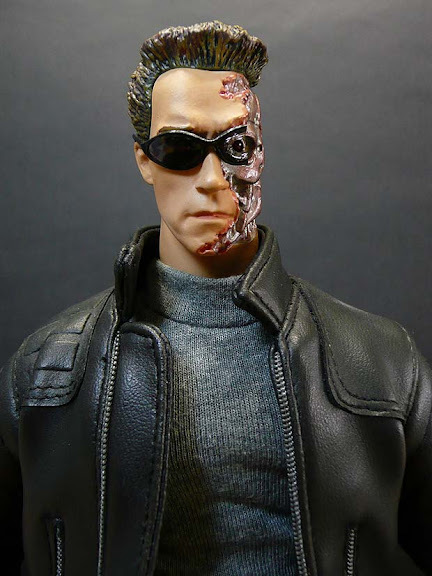 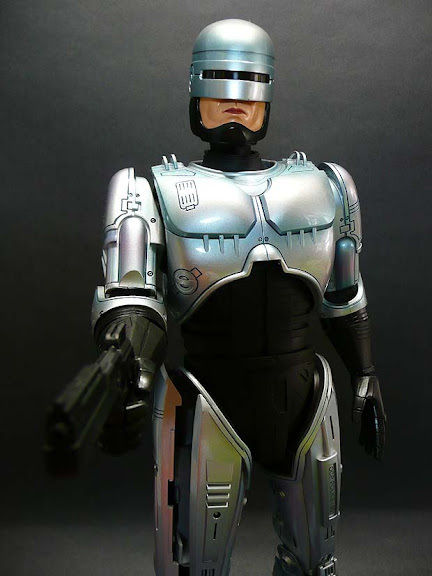 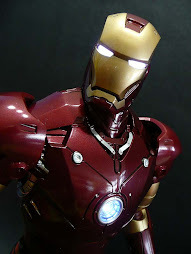 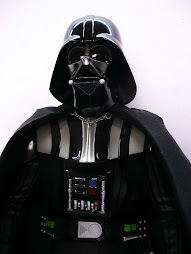 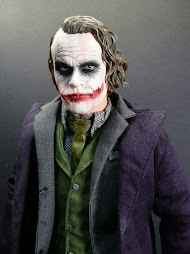 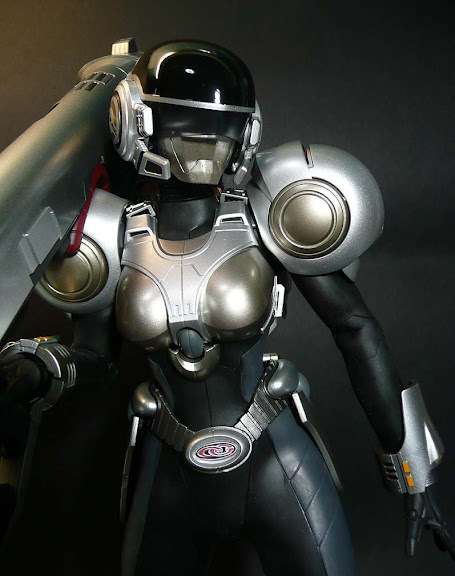 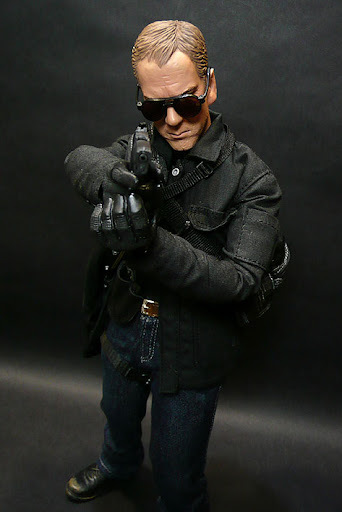 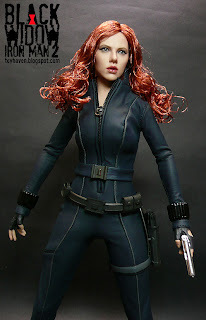 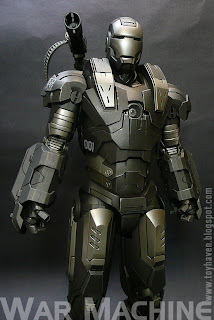 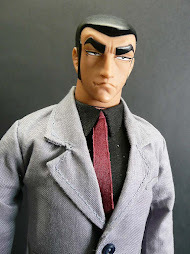 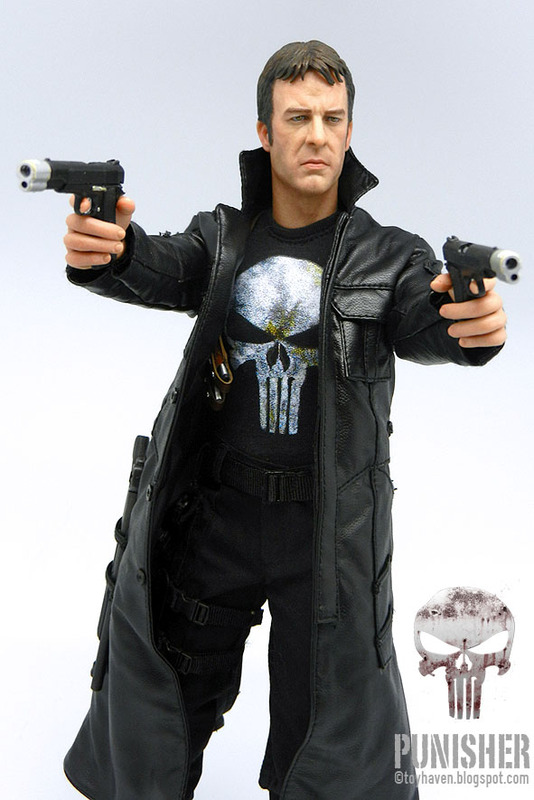 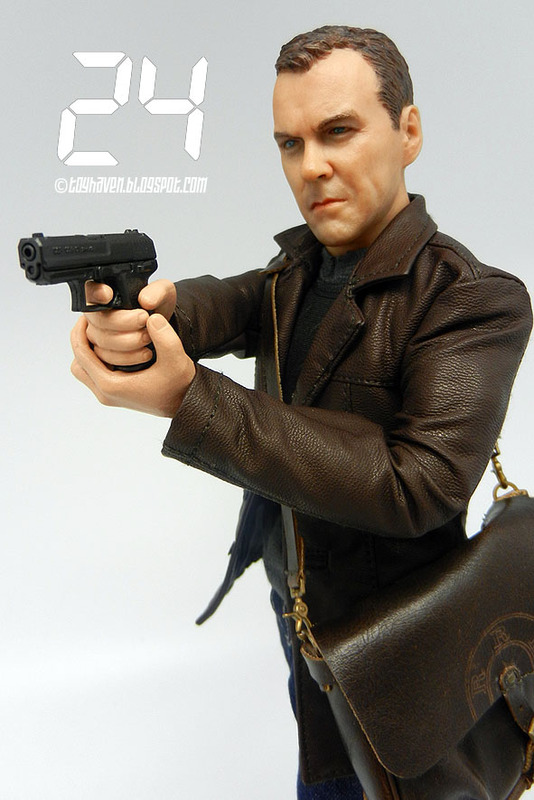 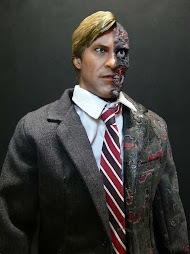 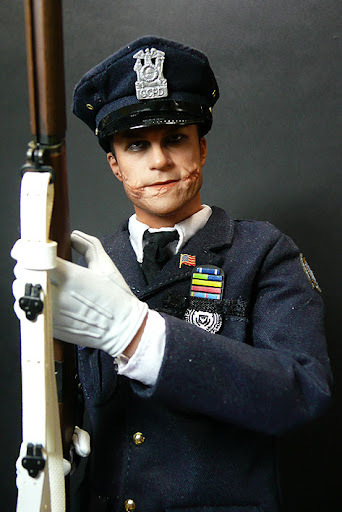 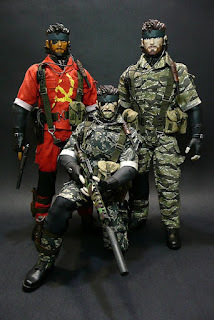 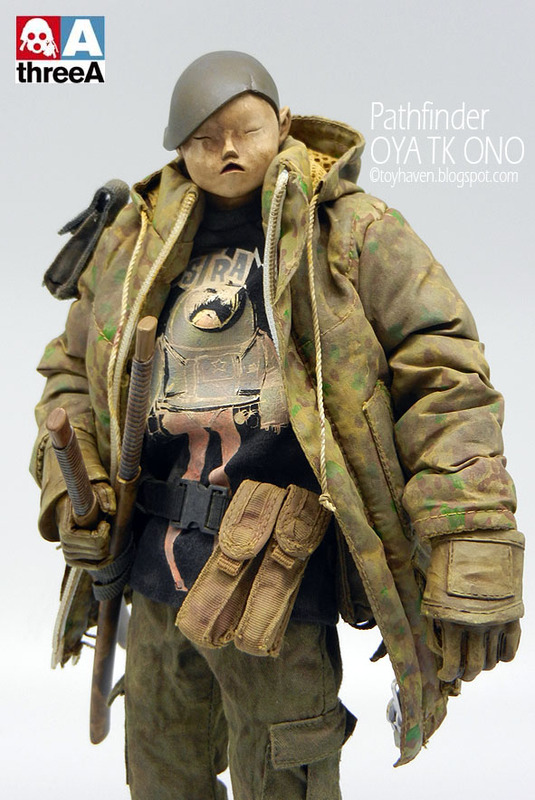 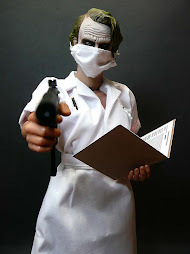 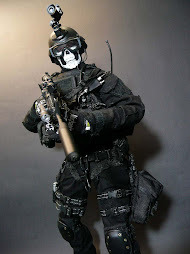 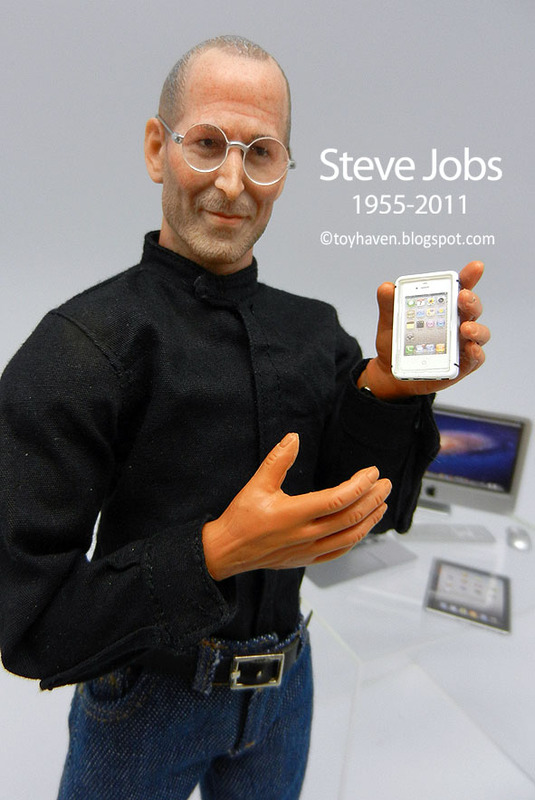 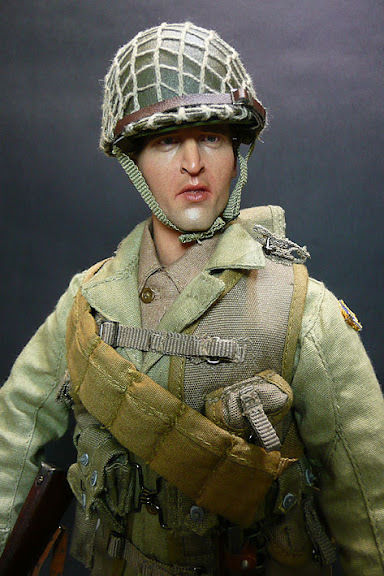 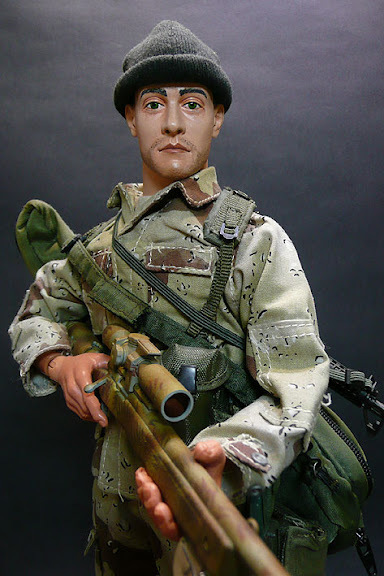 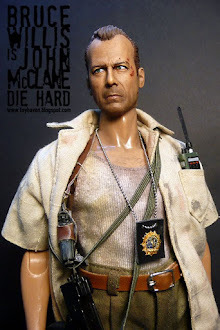 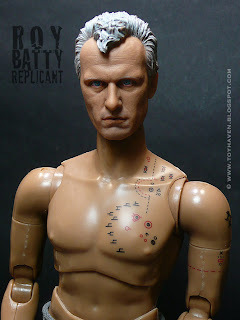 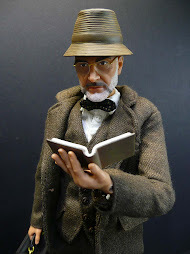 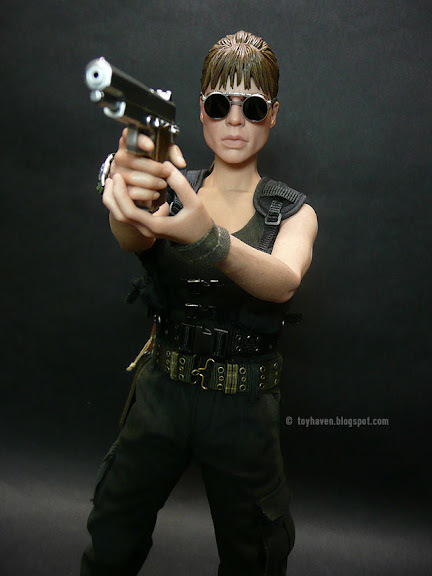 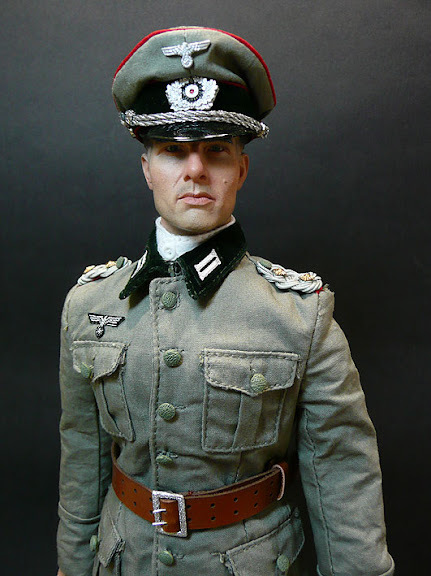 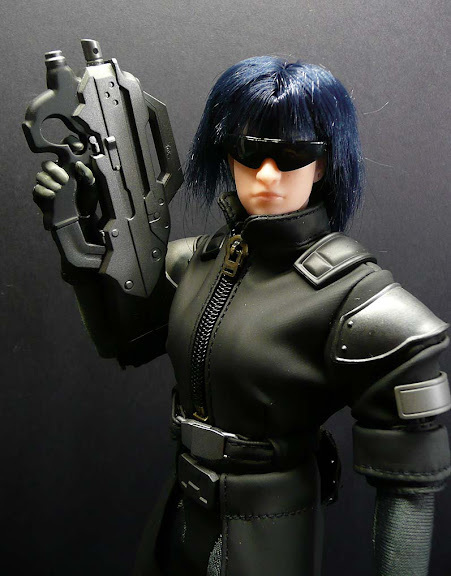 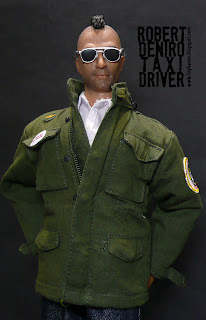 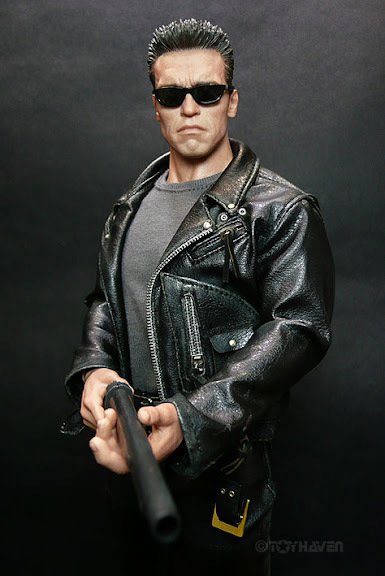 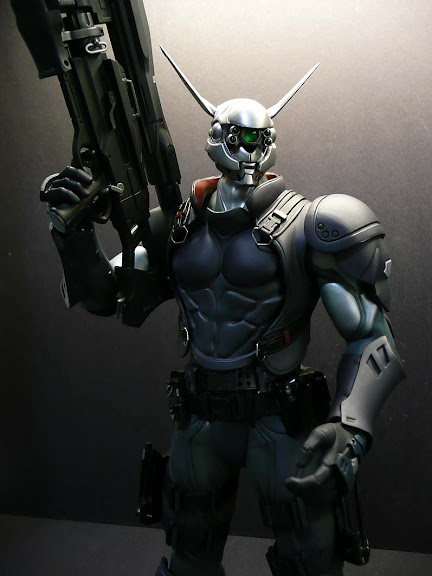 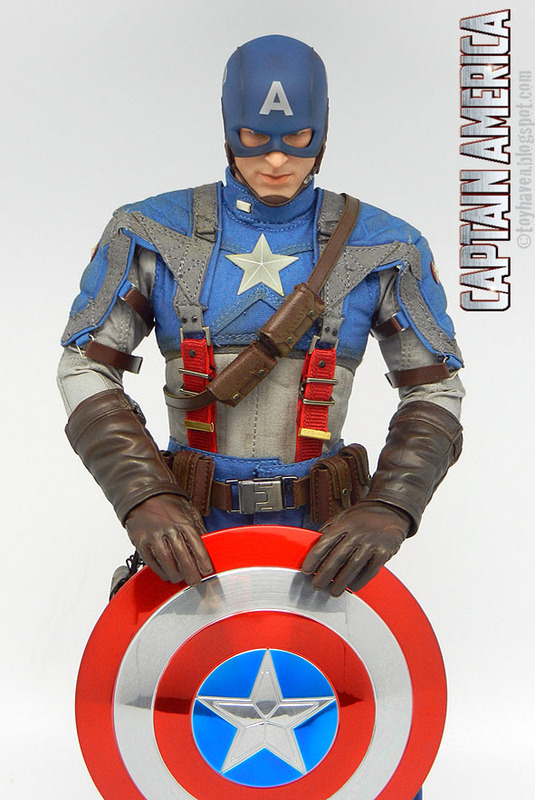 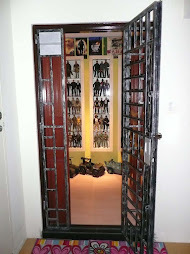 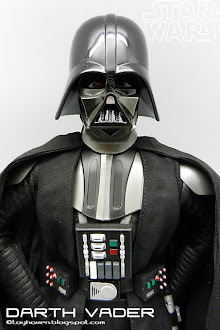 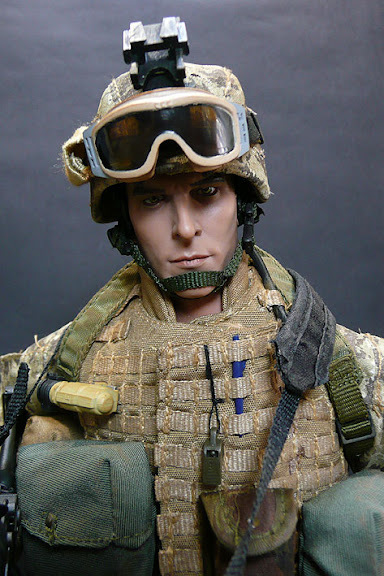 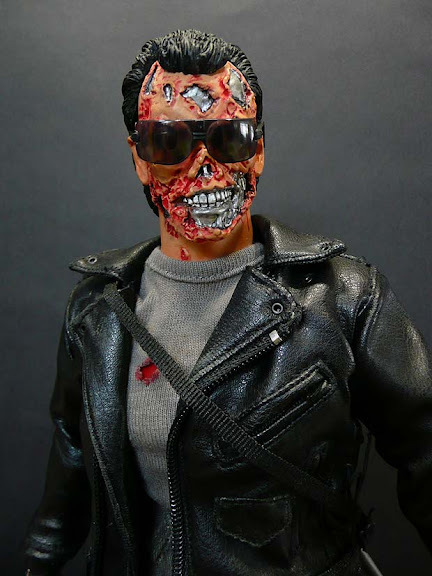 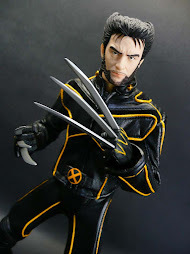 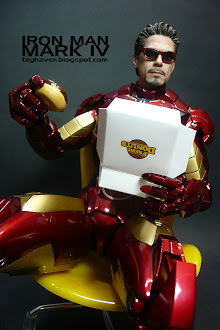 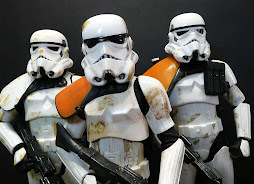 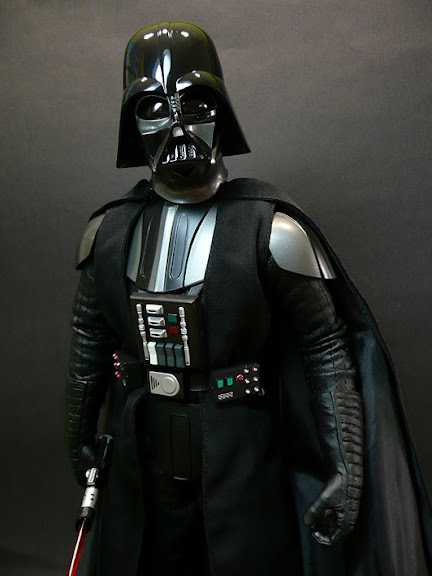 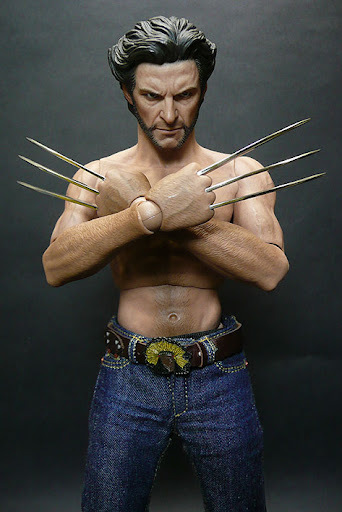 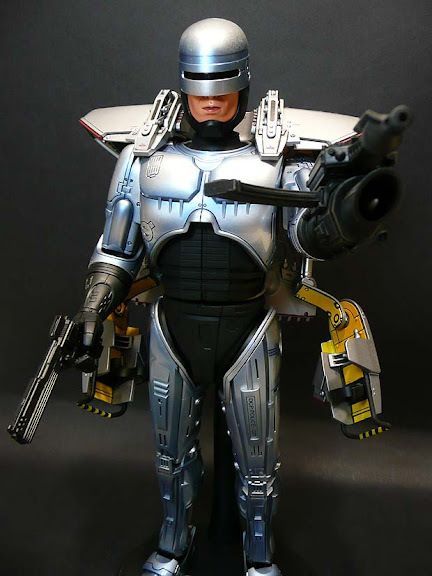 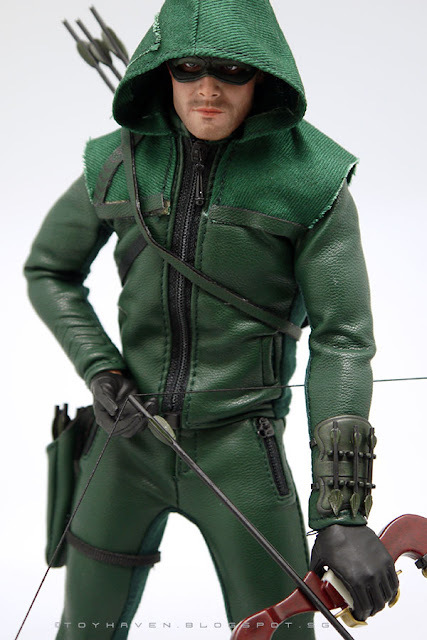 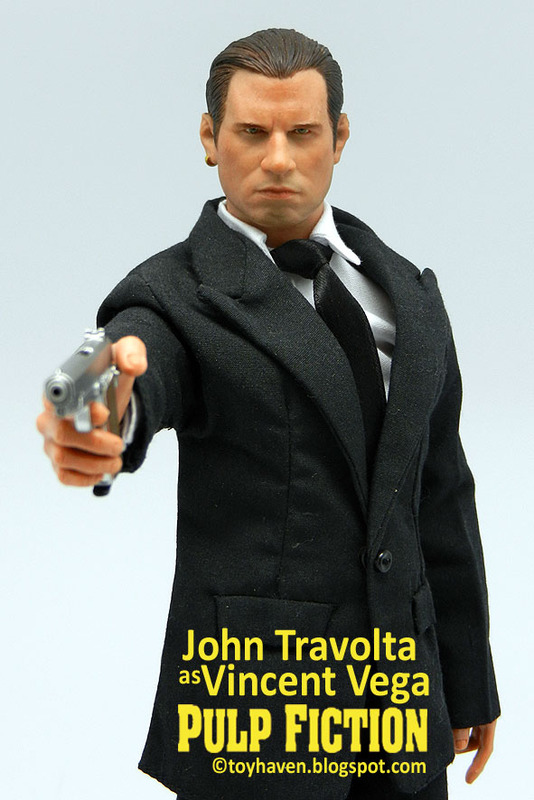 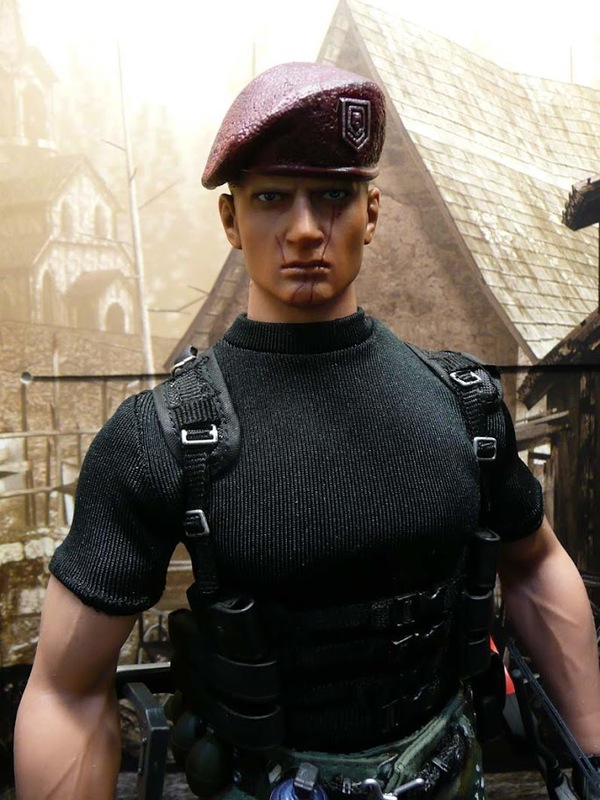 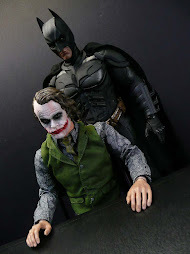 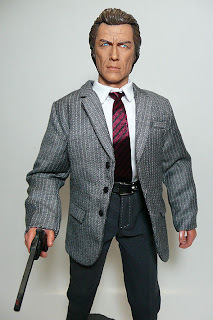 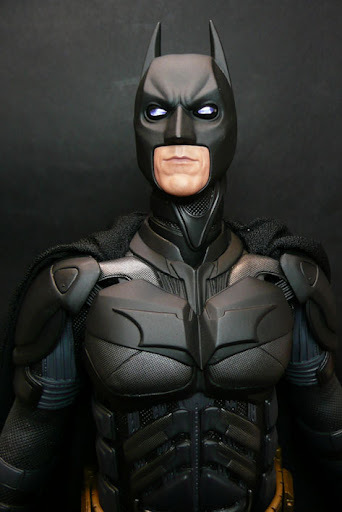 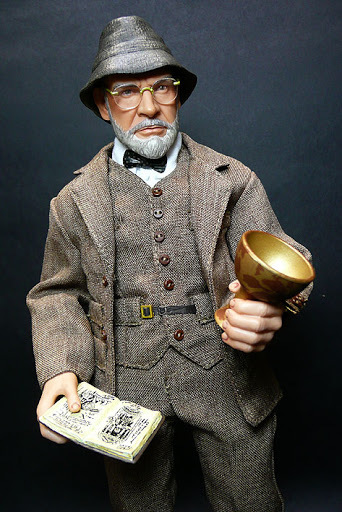 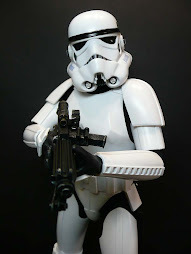 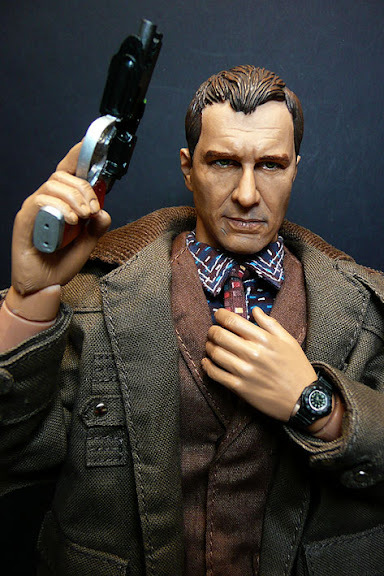 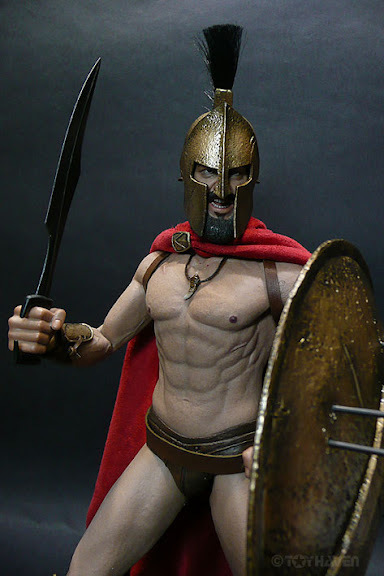 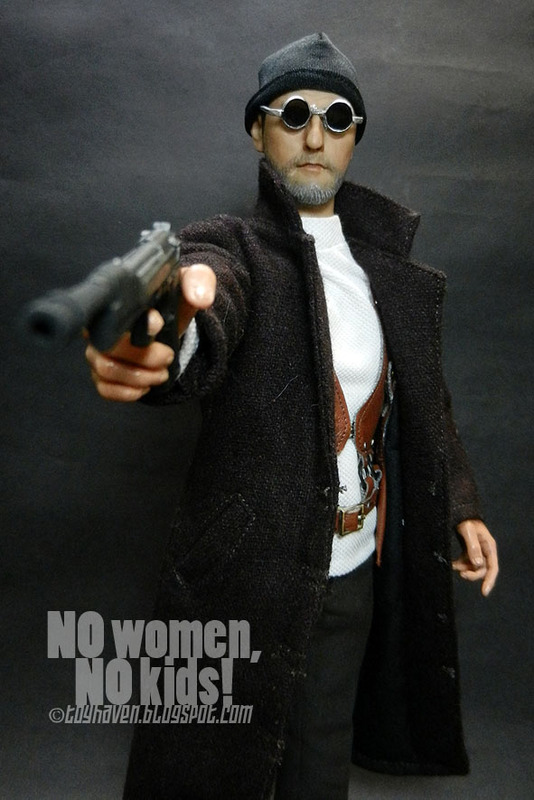 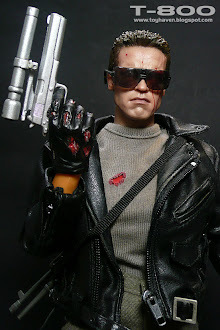 It does NOT include the 1/6th scale Head, 12-inch Figure Body or sunglasses (see picture below). 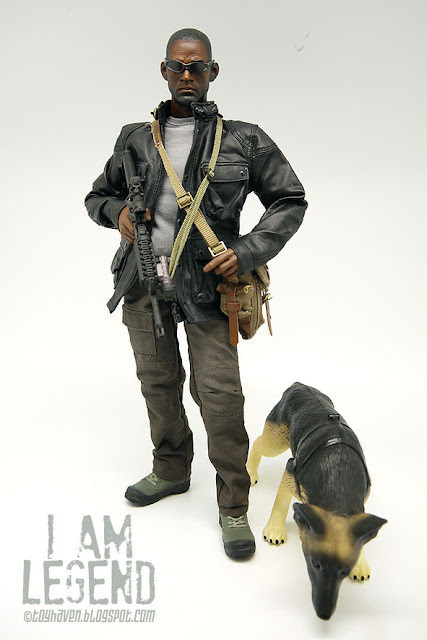 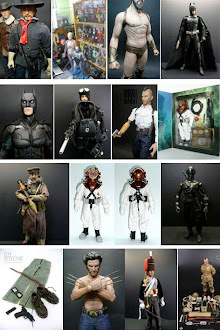 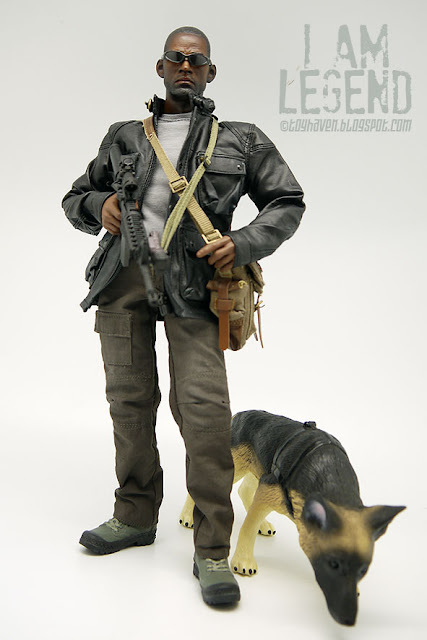 But it's got almost everything you need to make / customize / kitbash your own 1/6 scale Will Smith "I am Legend" Robert Neville 12-inch figure. 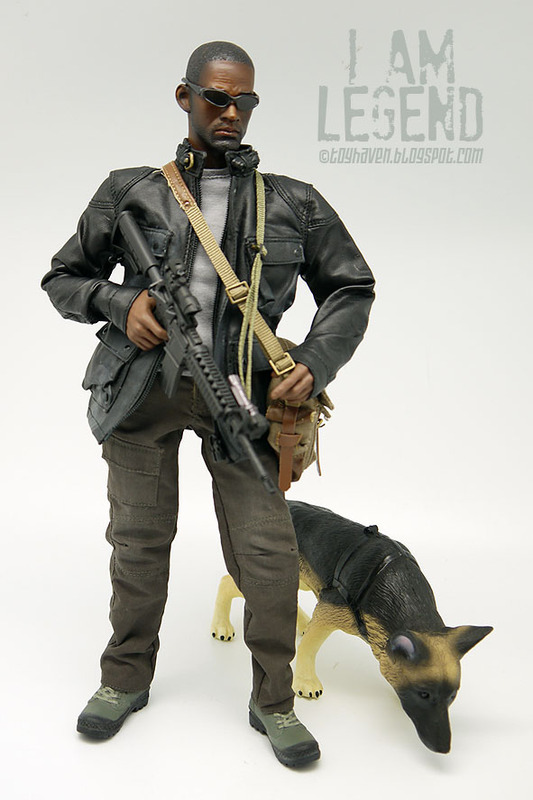 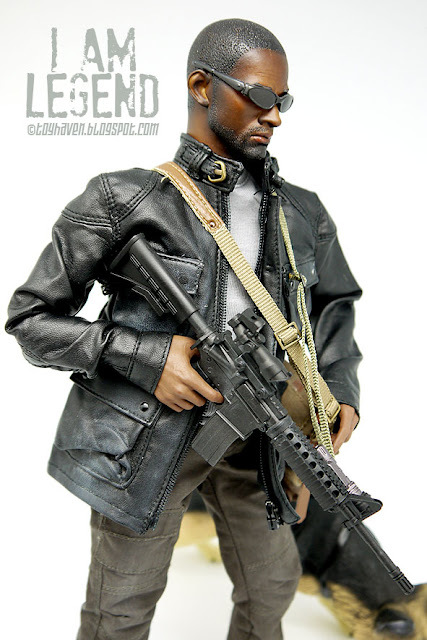 Here's Dr Figures 1/6 scale CIA Field Operator 12-inch Figure with Will Smith head sculpt (reviewed HERE) wearing all of MC Toys 1/6th scale Trialmaster Leather Jacket suit which also includes the M4 rifle. 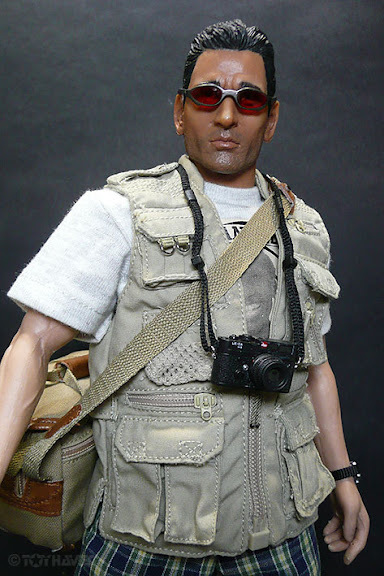 Sunglasses NOT included in the set. 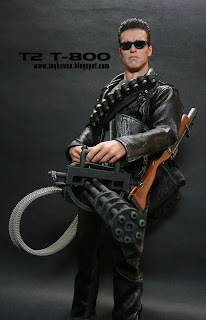 The sling doesn't fit the weapon so I had to use my own from my stash (see my toy blog post HERE). 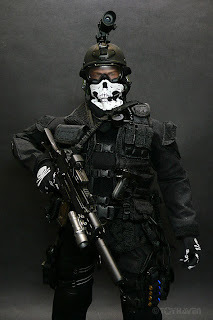 The tactical light also does not attach to the M4 handguard rail. 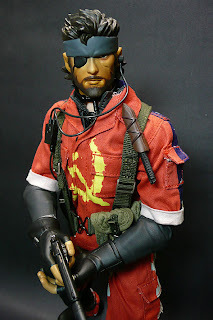 I had to use double-sided tape to secure it in place. 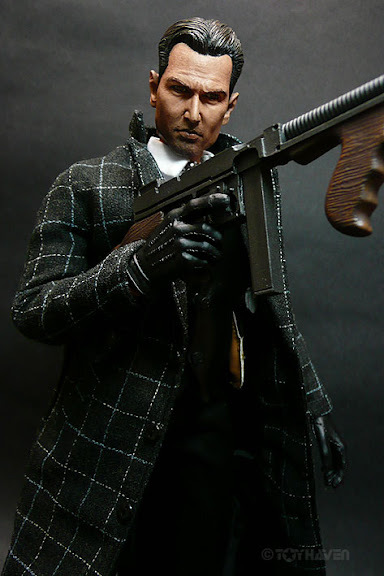 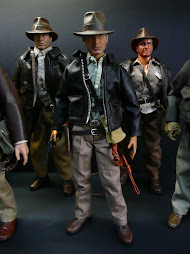 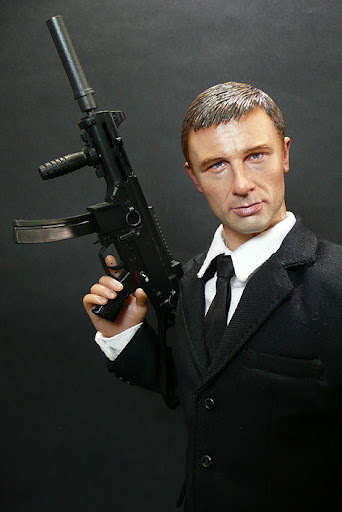 Other than the mis-matched rifle sling and un-attachable tactical light which a little double-sdied tape could fix, everything on this MC Toys 1/6 scale Trialmaster Leather Jacket suit is GREAT. 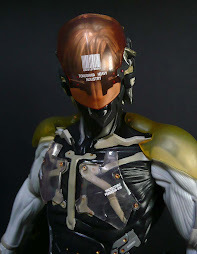 Oh yeah, one more thing - there's a small square sticker on the left jacket sleeve which comes off easily. 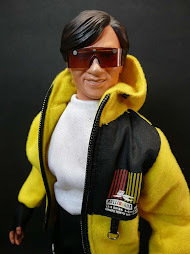 Mine got lost the moment I started to put the jacket on. 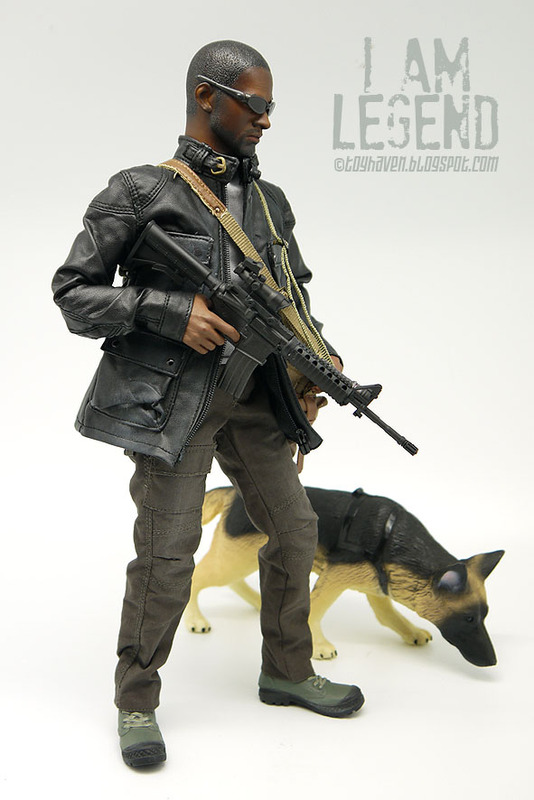 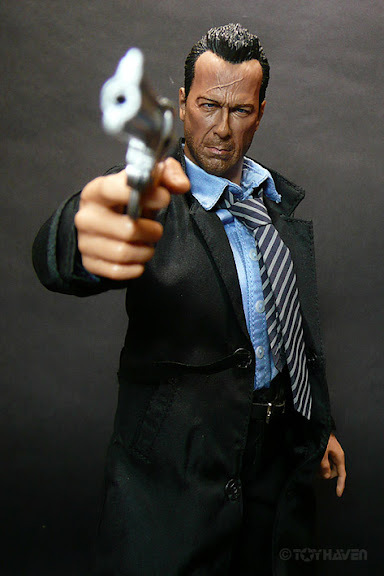 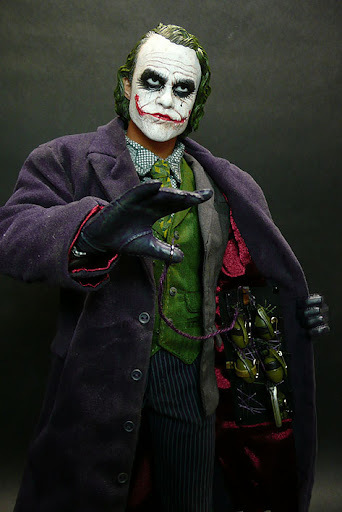 Scroll down to see more pictures of this kitbash 1/6 scale "I am Legend" Will Smith as Robert Neville 12-inch figure using everything that is included with the MC Toys 1/6 scale Trialmaster Leather Jacket suit. 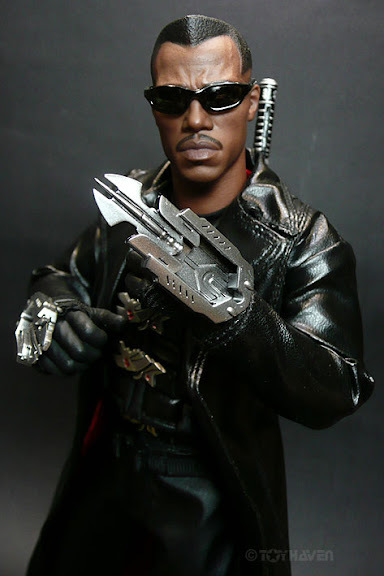 Neville is the last healthy human in New York City; the rest of the plague's survivors have degenerated into predatory, cannibalistic beings referred to as "Darkseekers" who hunt the immune humans as prey. 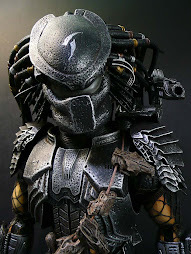 The Darkseekers are so named for hiding during daylight due to a painful intolerance of UV radiation. 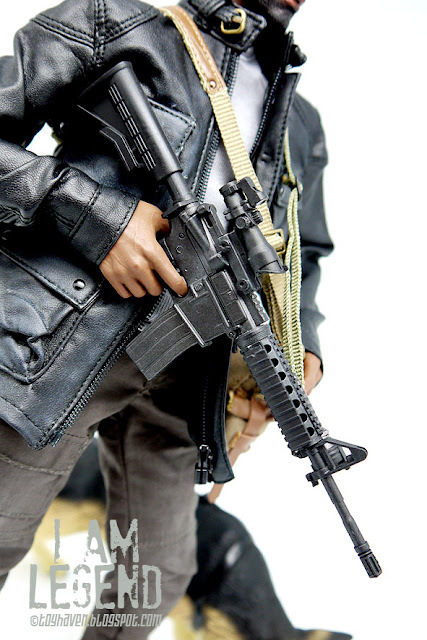 Robert Neville (Will Smith) uses a semi-automatic Colt AR-15 model that closely resembles an M4A1 carbine; this variant is referred to in the company's catalog as the "Law Enforcement Carbine", or the Model 6920. 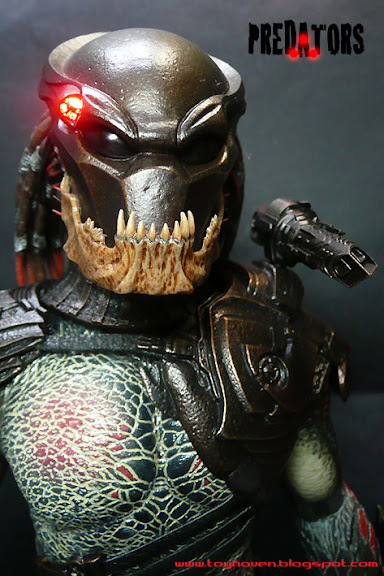 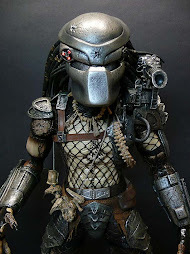 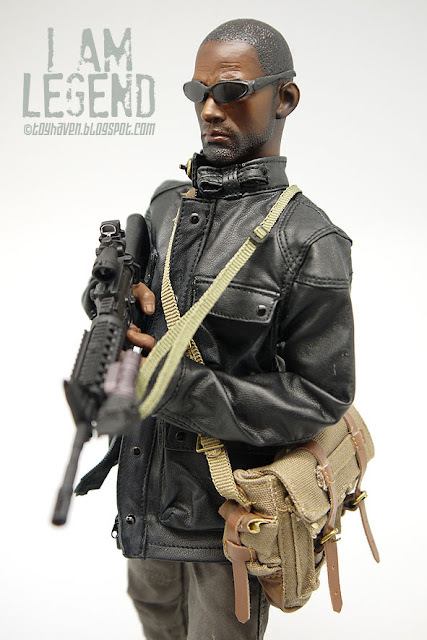 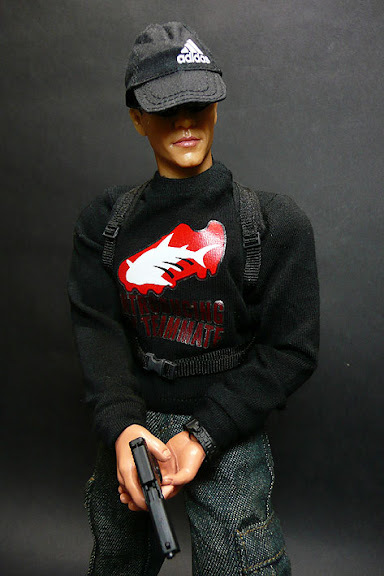 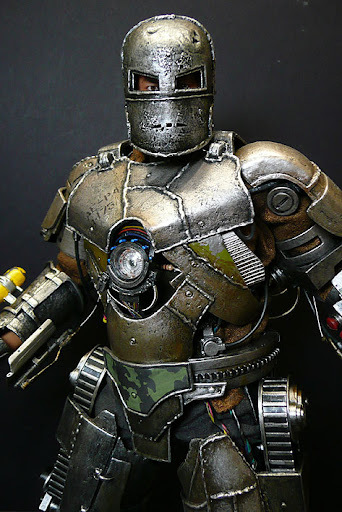 Close-up views / pictures / shots of kitbashed 1:6 scale Will Smith "I am Legend" Robert Neville 12-inch figure. 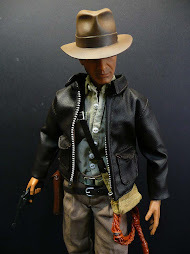 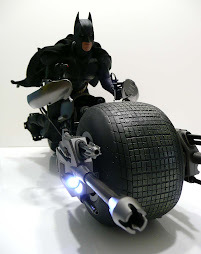 Like I said, I'm quite pleased with the outcome using MC Toys 1/6 scale Trialmaster Leather Jacket suit. 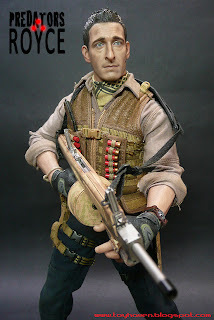 According to the internet, the LE Carbine is a semi-automatic-only variant of the M4 with a 16" barrel, but according to the Propstore of London, the weapon was modified to fire automatic for the film. 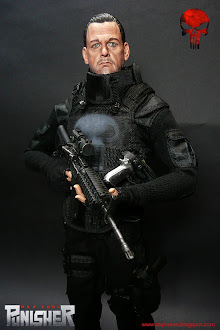 His AR is also equipped with an ACOG (TA31 Series) sight attachment throughout the movie. 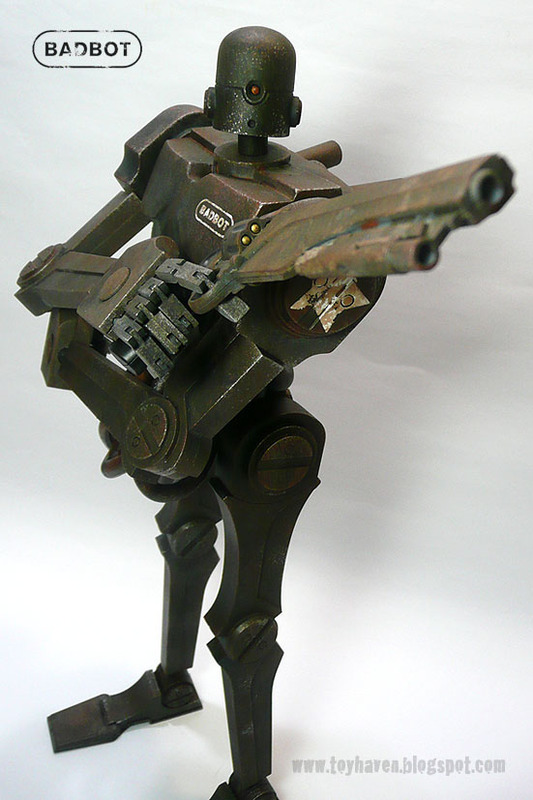 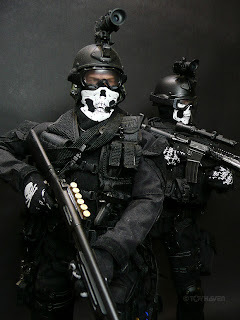 The tactical light on the gun is a Pentagon MD3R. 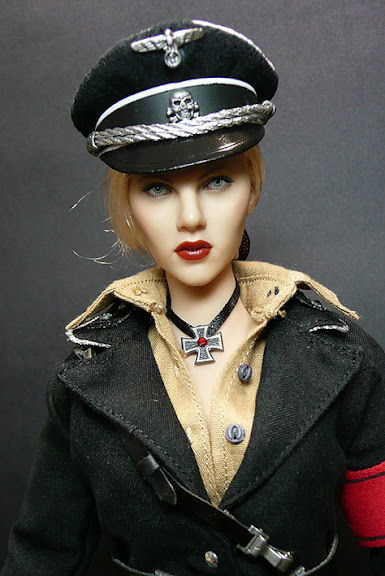 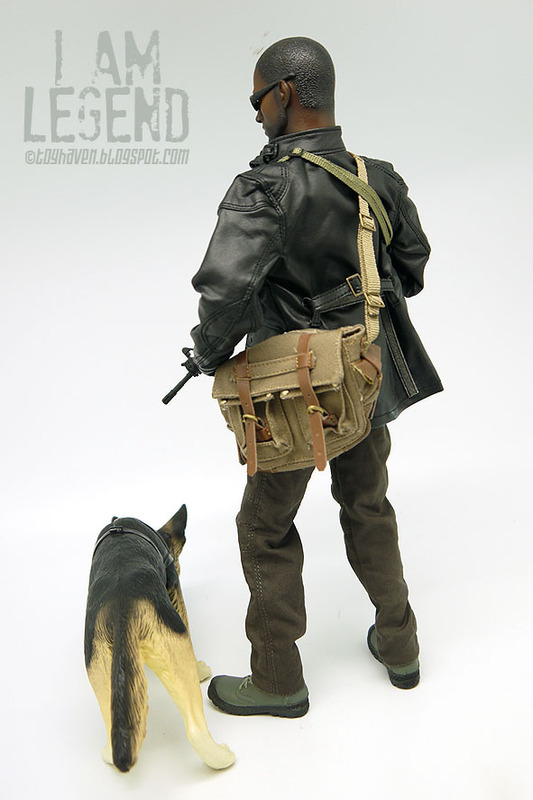 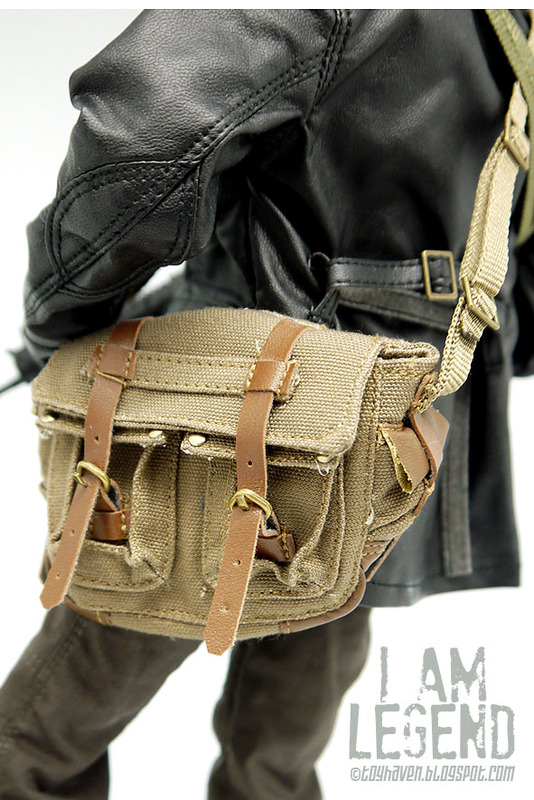 The MC Toys 1/6 scale Belstaff Shoulder Bag 554 looks pretty well made and it has all the nice details. 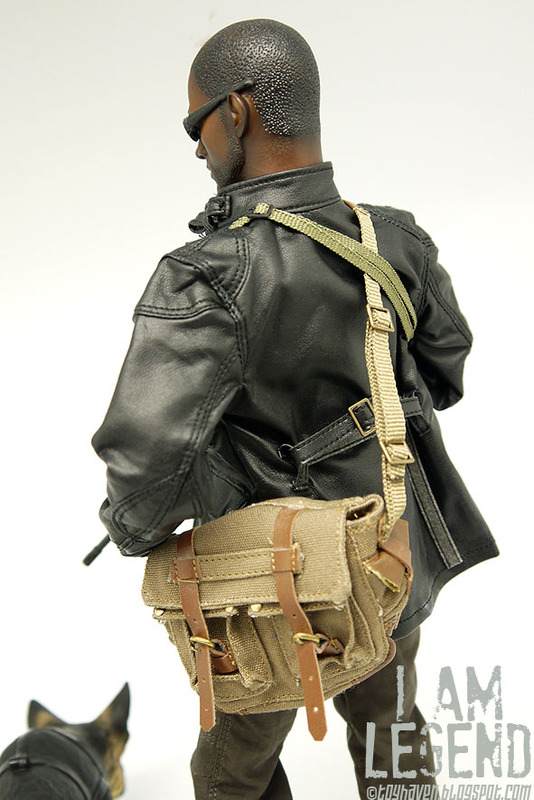 You can unbuckle the straps just like the real bag. 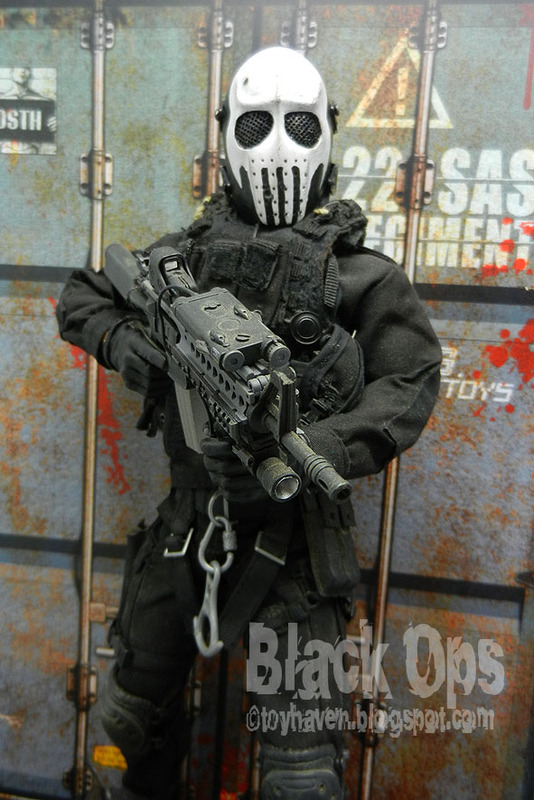 MC Toys has got themselves one very happy and satisfied customer, aside from the mismatched sling. 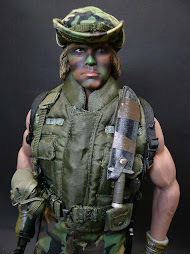 I had the same sling issue and ended up using an alternate. 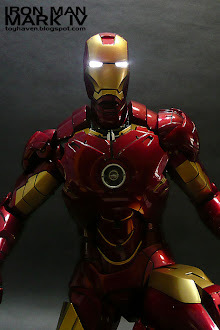 I have the light issue also but have not gotten around to attaching it yet. 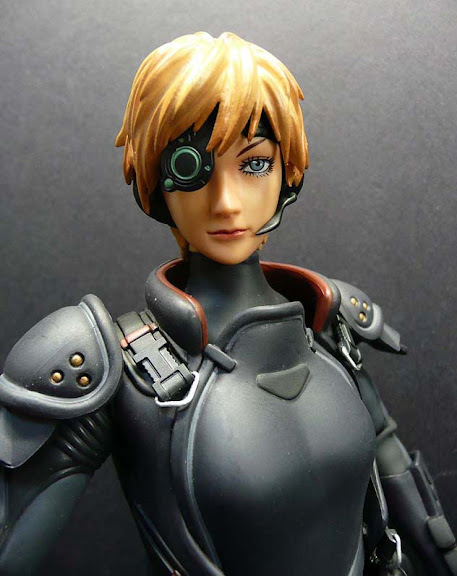 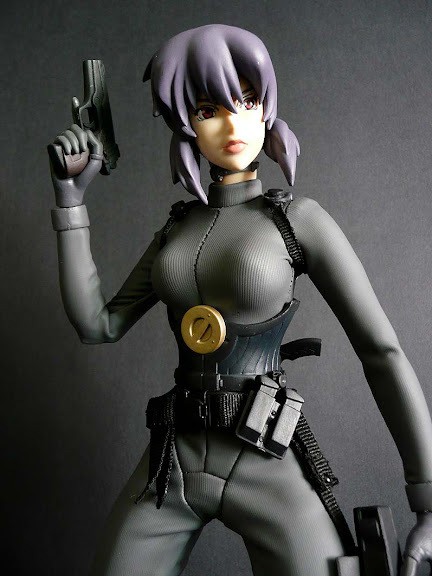 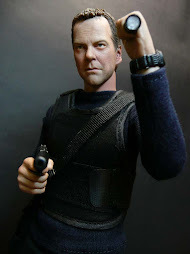 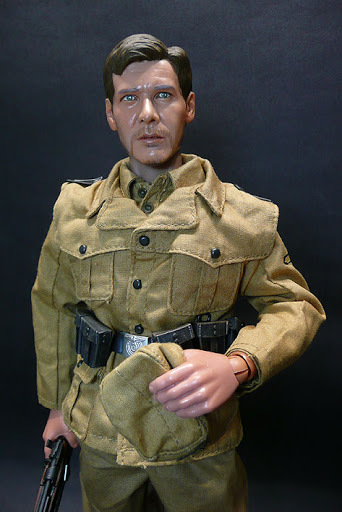 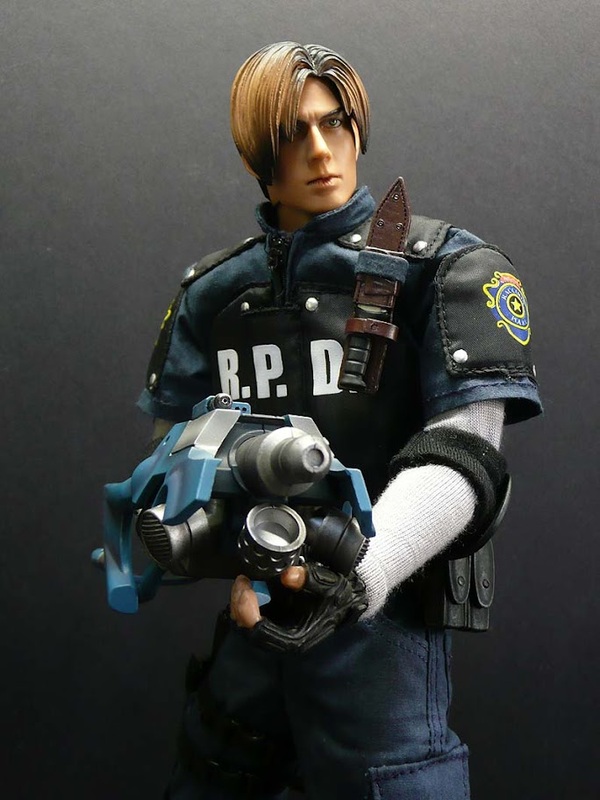 I am using the Enterbay head which is the same used in MC's promo photo but will probably switch to the Loading Toys D-boy sculpt because it is more accurate to the movie and I am using a Dragon shepherd from their bomb disposal figure. 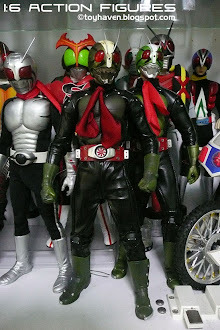 All in all it ends up being a great looking figure. 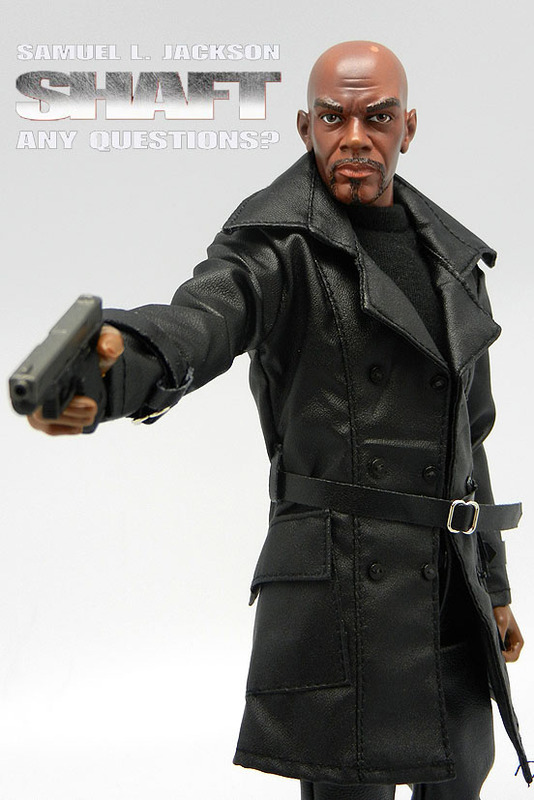 Check mine if you want alex. 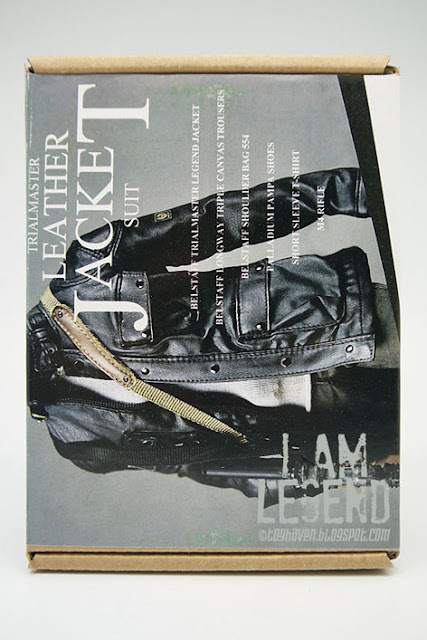 the logo of my jacket came off straight away, I had to stick it again. 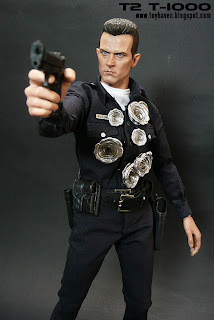 Which body did you use? 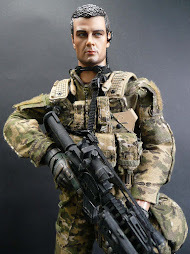 I used A TTL body and i could put the feet inside de boot. 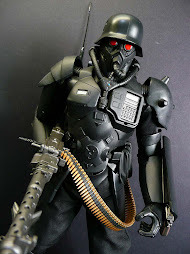 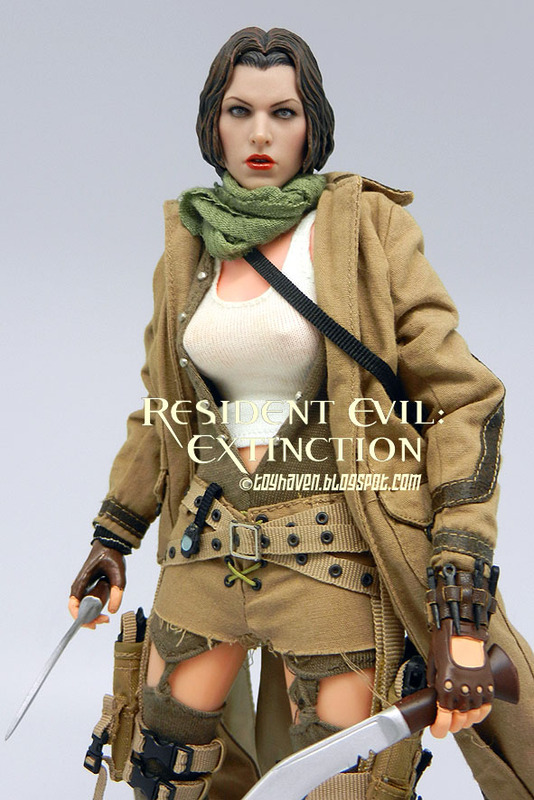 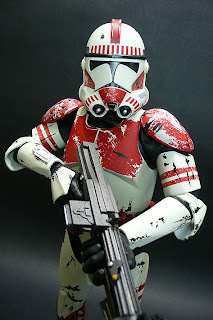 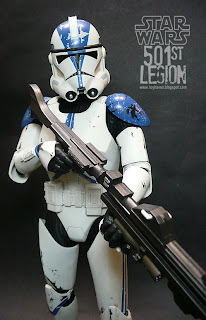 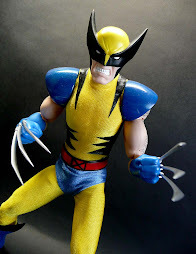 I may buy new boots for this figure. 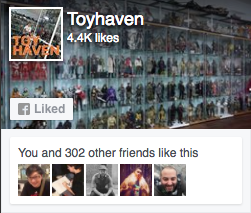 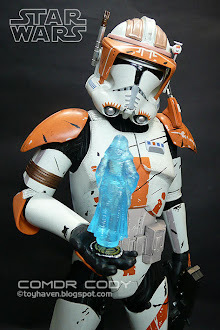 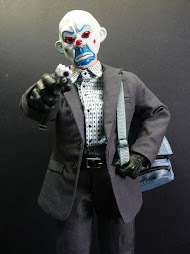 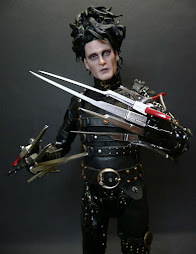 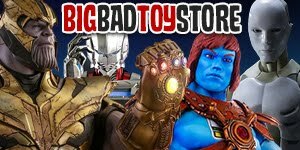 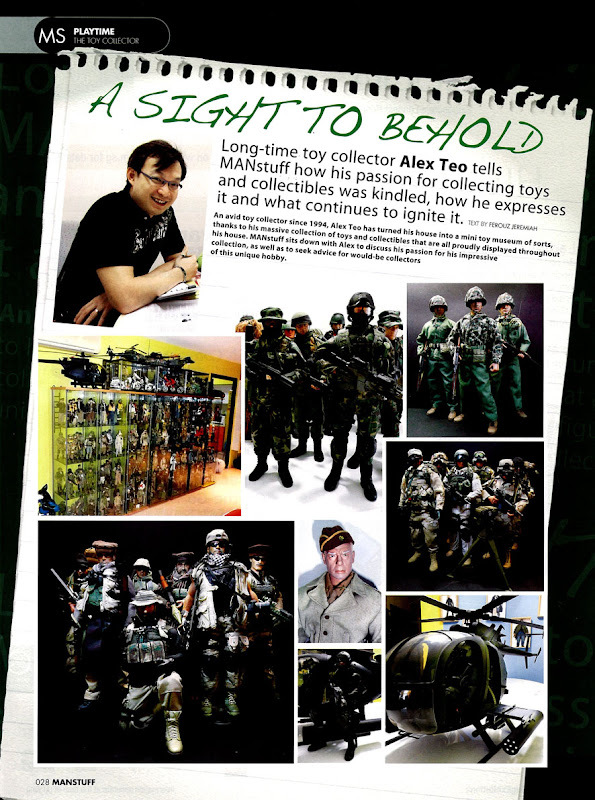 Hi Jako, I've put your blog site on my toy blog list. 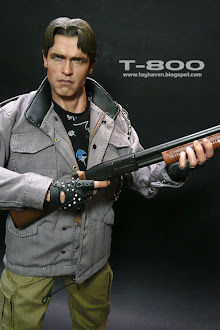 GREAT site with very NICE pictures (two thumbs UP). 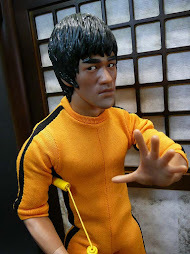 I will be visiting your site regularly for updates. 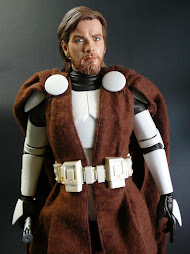 Hello , but this Action Figure is on sale ?